Patrick Stewart - known to geeks as Captain Jean-Luc Picard and Professor Charles Xavier - will be called "sir" in real life now: The 69-year-old actor will be receiving a New Years' knighting from Queen Elizabeth II. 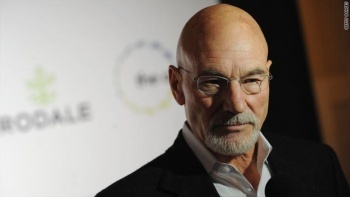 Though we of great nerddom may recognize the 69-year-old native of Yorkshire, England for his work on Star Trek as well as being one of the only real good things in the third X-Men movie, Patrick Stewart has been acting for most of his life. A man of the stage, he was a member of the Royal Shakespeare Company from 1966 until 1982, though he remained (relatively) unknown until he sat in the Captain's chair on the bridge of the Enterprise-D in Star Trek: The Next Generation. Just being Captain Picard didn't mean Stewart had to stop acting elsewhere - he's done Dickens as well as Shakespeare, too. He played Ebenezer Scrooge in a 1999 TV movie adaptation of A Christmas Carol as well as producing a one-man stage version of the classic story in which he played all of the 40+ characters himself. He's been Captain Ahab, Prospero, and Othello (in a race-inverted production, of course). He's been King Claudius in Hamlet, he's been Antony (of and Cleopatra fame), and he's done voice work in animated productions like The Prince of Egypt and games like The Elder Scrolls IV: Oblivion. In short: Patrick Stewart has done a hell of a lot of (pretty damn good) acting, and that's the reason why he's at the top of the list to be knighted by Queen Elizabeth II in the New Year. Knighthood rewards excellence and service in all fields, and is considered one of the highest honors a British citizen (or noncitizen, even) can achieve. Soon-to-be-Sir Patrick Stewart will be joining his good friend (and enemy, if you're counting him as Magneto) Sir Ian McKellen in knighthood, and there's a joke in there somewhere about mutant rights but eh, make it yourselves. Other names on the list include "designers, restaurateurs and two famous names from Formula 1 racing," but none of them were ever a captain of the Enterprise, huh? Didn't think so. I think I speak for everyone here when I say: "Oh, hell yes."